I was inspired by Abe’s recent spelt bake. Up until now I’ve only used spelt at 10% for extensibility. I originally intended to try 100% spelt, but milling it was a learning process for me. I’ve ground many grains, but nothing so far like spelt. The best way I can describe it is it felt a little like milling cardboard :-) The bran is soft and the extraction (#50) was unusual. I got about 80% extraction. The bran was difficult to chew, so I plan to use it to flour the banneton, at least that is my current choice. Since the extraction was lower than what I’m accustomed to I opted for 12% KA Sir Lancelot (14% protein) to complete the required flour. I would appreciate any advice and/or suggestions to lower my learning curve with this grain. I am excited to taste the bread to experience the flavor. DISCLAIMER: I haven't baked with spelt but I have followed a number of posts and assisted with general baking experience of different flours. My understanding is that it behaves a lot like rye( doesn't like a lot of handling), some like whole wheat (it needs time to hydrate),and some like low protein flour(goes from proof to overproof in minutes!). HERE is a long but explanatory post developing a 100% spelt loaf made in a Zoriushi bread machine. This guy really worked on developing his daily bread. If you enter spelt in the search box, there are many posts and several posters that are expert in this grain. Here is an image showing the large bits that were culled using a 1/20” screen. Once again, most of this is similar to the skin on a peanut. It is not hard and is somewhat paper-like. I inspected the individual berries and there doesn’t appear to be an obvious hull. Any ideas? I weighed the culled portion from each screen. 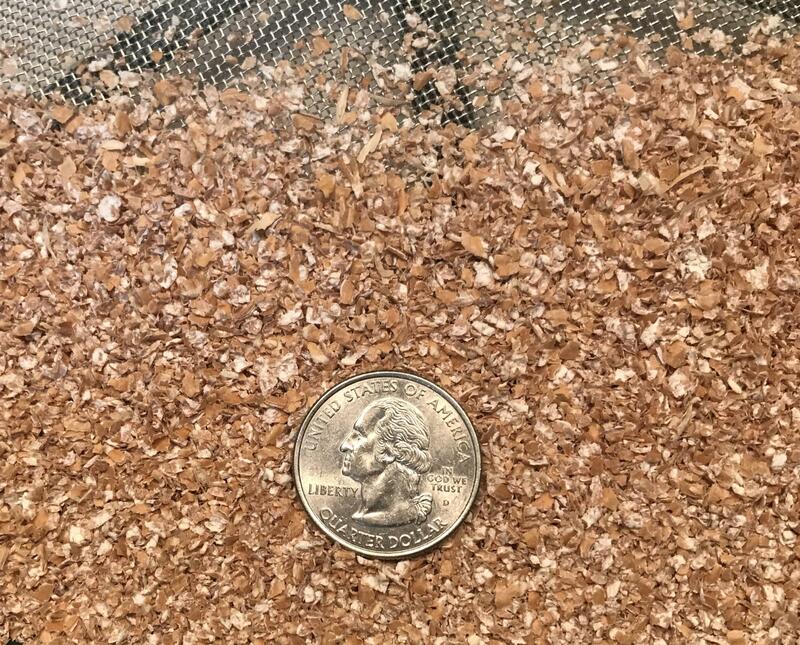 Total spelt milled was 143g. The extraction for the 1/50” screen was 112g (78%). The extraction for the 1/20” screen was 123g (86%). The spelt berry seems to be much softer than wheat. I have not milled anything that was similar to spelt. Dan, this looks very strange to me. Unfortunately I just ran out of spelt but as soon as I can buy some I'll post a picture of the whole grains before milling, and of the flour I get. So far I haven't seen what your picture shows. yes spelt is indeed soft but I wonder why those bran flakes are so large. One question, is yours a stone mill or a steel mill? I use a KoMo with stones. I tried re-milling, there was no change. Does your spelt mill like Hard Whilte or Red Wheat? Yes, I also found spelt to be a softer grain than wheat when milling. Bran separation in a small home mill seemed better to me than wheat. Looking at some old results, I ground 200g spelt grain, sifted @ #40 and ended up with 157g flour and 38g bran (5g mill retention/loss). I did reprocess the bran in a leaven (tend not to bother with that these days) and was very happy with the loaves, according to my notes, so no issues with chewy bran. 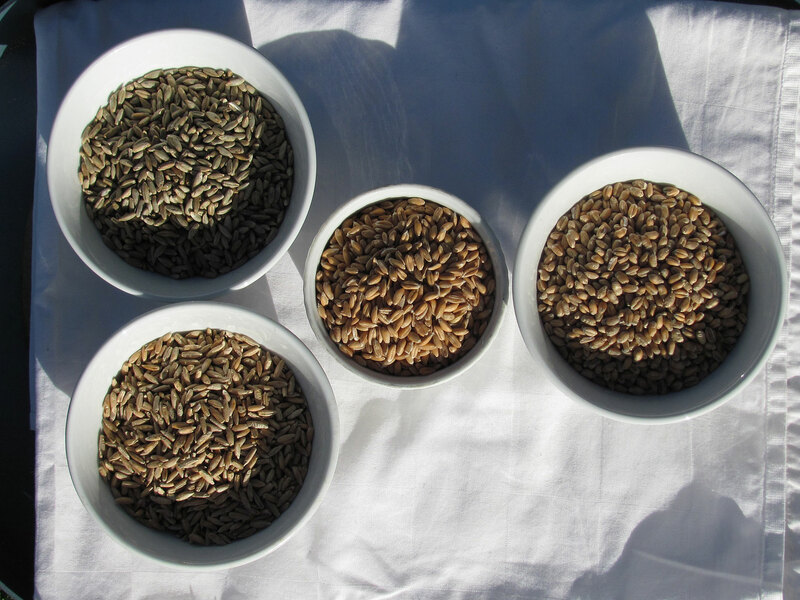 In the two little bowls on the left, there are the two varieties of rye that I use, the one in the middle holds the spelt, and to the right there is a sample of the wheat I use so that you can compare the colours. (I took them out into the garden as my kitchen is rather dark). 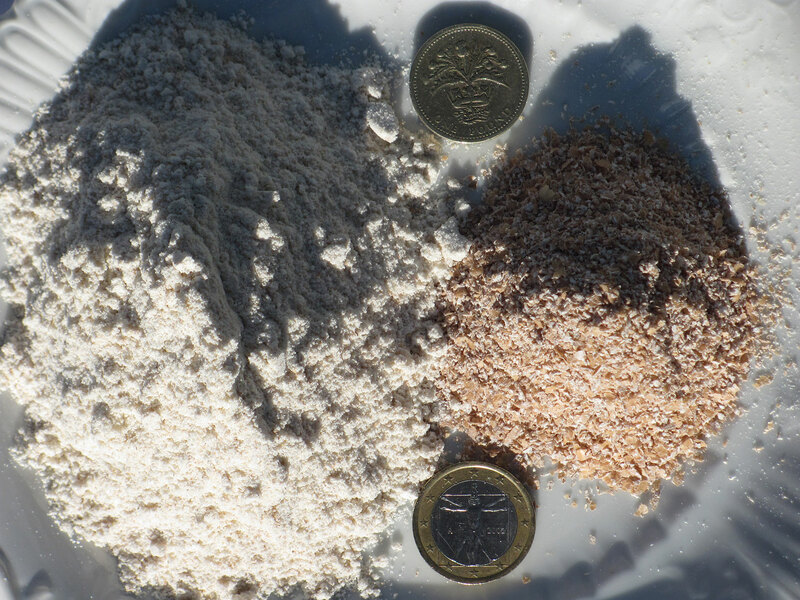 The second picture shows what all these varieties look like after having been put through my KomoMio, all milled the same way. Lastly, there's the whole content of the spelt bowl after putting it through a tea strainer (no flour sieves here, sorry). The spoon is a teaspoon, btw. I don't think the bran is as coarse as yours was. No idea whether that helps with your problem! The images are informative. They confirm my results as ordinary. I think my bran looks much like yours in the third image down. My bran looks bigger because of the closeup shot. Please explain all of the ingredients in the image third from the bottom. I recognize the spelt bran. BTW - try chewing the spelt bran. It never goes away. I imagine after hydration and baking it is much more chewable. Probably not noticeable. I started to use spelt when one day I had run out of wheat flour, for a bread that was wholemeal rye for the production sourdough and then I found I had no wheat flour left for the final dough. All I had was a packet of wholemeal spelt so I used that instead (that was before I got my mill). I totally loved that bread! Thanks TreeSparrow, but I’m trying to figure out what are the various ingredients in the third image from the top. What are the dark flours? Is the white flour your extacted spelt? oh sorry I thought you meant the third from the bottom. You mean the two little heaps on that breakfast plate with the teaspoon next to it? That is the amount of spelt flour that sat in the little porcelain bowl, after I had put it through the tea strainer. 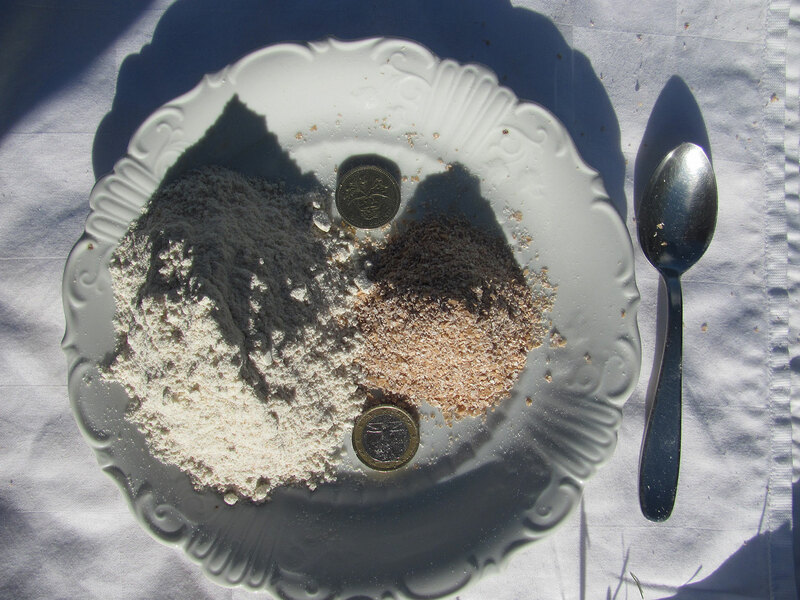 Left is the sifted flour, right is the bran. Click “edit” at the bottom of any comment you post. If you don’t see an edit button, the owner of the site (Floyd) may have to edit your permissions. thanks for the explanation, because I actually don't get to see it! I'll contact him. I should perhaps also add that our kind of wheat flour here (Northern Europe) is nowhere near as "strong" as yours, maybe more like spelt ;-) And I always use large amounts of wholemeal flour so it wasn't a big leap for me. "...try chewing the spelt bran"
I use a fair amount of spelt, have never bolted it though. It seems to mill just like everything else in my Komo. I only use whole grain flour, no white flour thank you. I have made 100% spelt bread, 50/50 spelt and wheat, and just baked a 33/67% spelt rye loaf today, which came out quite nicely. Spelt benefits from a pan to support it, rises nicely but tends not to hold it's shape without support. Pullman pans lend good support to prevent spreading as it proofs. As had been said previously, it doesn't tolerate too much kneading, stretch and fold is fine. It takes less water to hydrated, has a very pleasant mild flavor. It works well with Kamut in a 50/50 blend, one of my best loaves so far. Spelt bread (Dinkelbrot) is one of my favorites to eat in Germany. I have mainly encountered it there as a panned bread, sliced thinly. Dense and moist crumb. No holes whatsoever, this is not a California sourdough, it is rather a completely different item. I don't mill my own flour, so have no experience to offer on that aspect. Spelt has a lovely flavor, and I enjoy it together with whole rye and all purpose flours. My base recipe is Tom Cat's Semolina Filone, from this site. My method is unchanged from the base recipe, however the flours are all changed according to my taste of the day. I use whole spelt (Dinkelvollkornmehl) in proportions up to 50%, in combination with whole rye, whole wheat and all purpose wheat flours. Spelt has little gluten and I reduce main dough hydration when using spelt fraction greater than 25% by weight, to help with forming and proofing. My daily bread is a Brötchen (roll) made with a blend of the above flours. 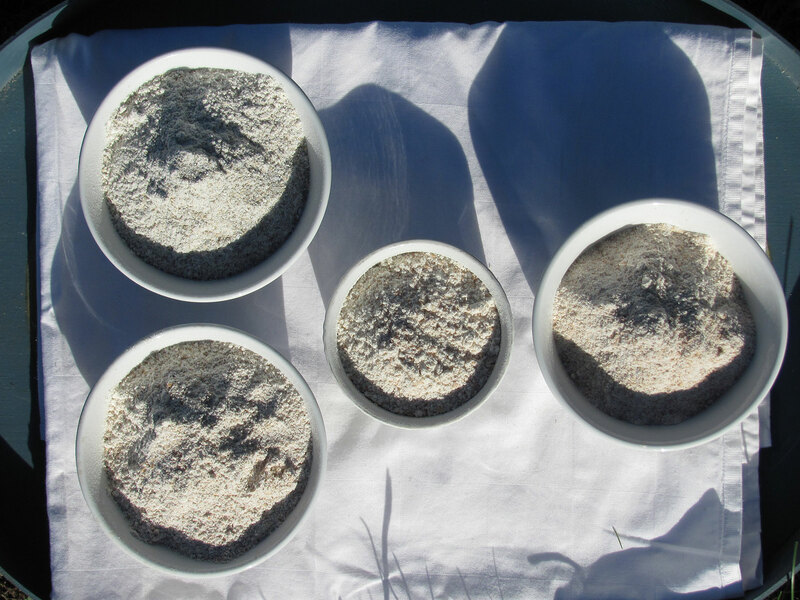 Most commonly the mix is equal parts whole spelt, whole rye and all purpose flours. The Tom Cat's recipe yields about 8 rolls. I typically eat half a roll in a meal. Bake at 525 for 25 minutes, give or take depending on the normal variables. Nice oven spring and wonderful flavor. No holes, it's not that sort of thing.